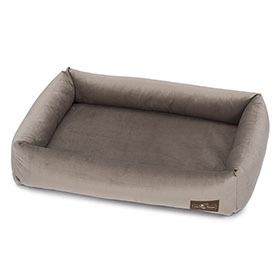 This clever design from Jax & Bones combines function and comfort in a lounge style memory foam dog bed. Bolstered sides are overstuffed with their signature eco-friendly Sustainafill fiber. Covers unzip for easy cleaning. All fabrics are machine wash & dry. The center pillow is made of top of the line memory foam wrapped in a zippered water resistant pillowcase. The cover can be removed for cleaning, but do not wash the memory foam. All Memory Foam Cuddler Dog Beds are made using top of the line upholstery grade fabric in a variety of colors to compliment your home and lifestyle. Each Jax & Bones bed is custom made in California. Please allow 7-10 days for shipment (10-14 days during holiday season). Jax & Bones custom made beds are not returnable unless defective. Remove covers from bolster and center pillow to clean. Do not wash memory foam.